In which, I sink into new depravities. There’s a fairly straightforward correlation between your interest in another culture and the degree to which your native culture starts thinking of you as a little weird. Taking Japan as the example here, it’s not too weird to go out for the occasional sushi dinner. Add a couple of Hokusai woodblock prints, and you’re even in the “classy” tier of cultural interest. Maybe even watch a couple of Studio Ghibli movies, you’re still good. Then, maybe you have conversations about seeing Dragonball or Sailor Moon on TV, and you’re starting to slip a little further away from acceptability. Add a Crunchyroll subscription or a Hatsune Miku Nendo on your desk, and people will start filing you into the category of humans that maybe shouldn’t be invited to dinner parties. Devote yourself to your 2D waifu, maybe make a little shrine, maybe buy a hug pillow, maybe marry your hug pillow, and people start to ask whether maybe there’s some way to get the police to look into what sorts of things you get up to in your spare time. And then, when you descend even further into the depths of obsession… there, hovering just at the event horizon of madness, there you find the railfans. For the record, I don’t know as I’m quite there, nor do I think I’ll ever be quite there. I don’t quite have the personality that leads to hanging out by the train tracks trying to snap a photo of a rare locomotive. But, well, maybe call me train-curious. 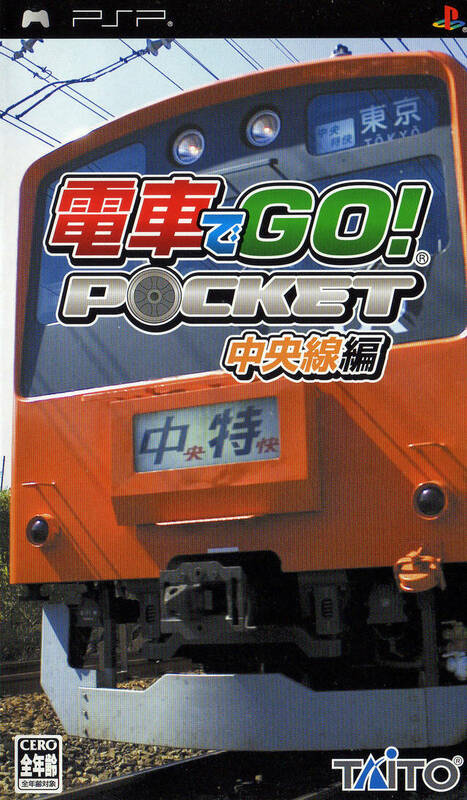 Not ready to dive into the subculture head-first, but interested enough to try a game like Densha De Go! Pocket, a game in which you drive passenger trains and in which you’re graded on (a) meeting your schedule, (b) stopping precisely at the stations on your route, and (c) obeying posted speed limits. I swear, from here I HEARD you close the browser tab. For the record, when I picked up DDG, I thought I was buying the version based on the Yamanote line. That’s the loop line that goes around Tokyo, and I have spent an awful lot of time riding it myself. So, yes, I intended to buy a game about driving a train in a circle and obeying speed limits while doing so. It turns out, the wrong disc was in the case and I instead wound up with the version of Densha De Go! Pocket that covers the Chuo line, which intersects with the Yamanote at Shinjuku station but which generally goes out of Tokyo and to more rural parts of the metropolitan area. I’m not as familiar with the Chuo line, so when I realized that I had the wrong disc I was more than a little vexed. I shouldn’t have been – while, sure, it’s not exactly the experience I had in mind, it’s still a very comforting and meditative experience to listen to track sounds and announcements and station jingles and pilot virtual commuters to their destinations. The track graphics aren’t amazing by modern standards, but they’re not bad by PSP standards, and the Chuo line version even lets you unlock the Narita Express, which is one of my favorite trains to ride as it usually means that I am going from the airport into Tokyo. I’ve only put a couple of hours in. I’ve gotten better, I think – my first attempt at coming into a station left me coming to a stop 19 meters beyond the place I was SUPPOSED to stop at, and my latest had me land only 28cm off the mark – but there are a lot of tracks to unlock still and a ton of depth left to plumb. And maybe I can find a copy of the Yamanote version someday. That would be cool, too.